This page shows the latest Communiqu 2015 news and features for those working in and with pharma, biotech and healthcare. MHP Health's Rachel Rowson took home the Publicis Life Brands Resolute Award for Emerging Leader in Healthcare Communications at the 2015 Comm uniqué Awards. ... See the full results of the Communiqué Awards 2015. 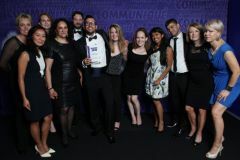 AstraZeneca's Amie Baker has won the Comm uniqué Award for the 2015 Healthcare Comm uniqué tor while the company also took home the award for best in-house team of ... See the full results of the Comm uniqué Awards 2015. Taking place in London next month, Communiqué Awards 2015, are one of the leading Award ceremonies, recognising the very best in healthcare communications. ... This year’s awards will be presented at London’s Grosvenor House Hotel on 2 July 2015.